Every April 28th is the World Day For Safety and Health at Work. This year’s topic chosen by the International Labour Organization to commemorate this day was ‘Workplace stress: a collective challenge’. The ILO’s choice wasn’t perchance: increasingly, studies are showing that stress is the ‘hidden killer’ in workplaces across the globe. The effects of stress on a person’s health are well-known, being a causal or contributing factor to everything from cardio-vascular diseases and various cancers to hypertension and a host of other diseases. But what of the impacts of stress on occupational safety? But being unable to address stress in the workplace is inhibiting. And as any safety professional knows, inhibition in the workplace is not conducive to working safely. If stress is potentially so dangerous in the workplace, why is it still perceived to be an ‘embarrassment’ for so many in the workplace? It continues to be seen by (too) many in management as a ‘personal thing,’ almost a ‘luxury’ that is somehow tantamount to being unprofessional. And if a worker has to keep hiding their stress at work what are the chances that their stress levels may impact on their ability to work safely? Does one need studies to assess the obvious? Mind, a UK mental health organization, speaks of the “stress taboo” in workplaces, and had this to say in an October 2013 report: “New statistics from Mind released today suggest that stressed workers are suffering in silence and employers aren’t doing enough to tackle stress. 45 per cent of workers polled by the charity said that staff are expected to cope without mentioning stress at work and a third (31 per cent) said that they would not be able to talk openly to their line manager if they felt stressed.” Would findings be much different in the U.S? And is that anything to be proud of in any society? To what end this inability to address stress openly and proactively in the workplace? It surely doesn’t make any worker safer. Stress is not the exclusive domain of the occupational health practitioner or company nurse. Nor will referrals to psychologists by the company’s wellness or employee assistance program suffice. No, the issue of stress, in all its complexities and enormities, must be considered by any and all safety/EHS professionals. It is not merely a mental health issue – it is a worker wellness issue with immense adverse potential with regard to occupational safety. Stress is as pertinent to safety as it is health. 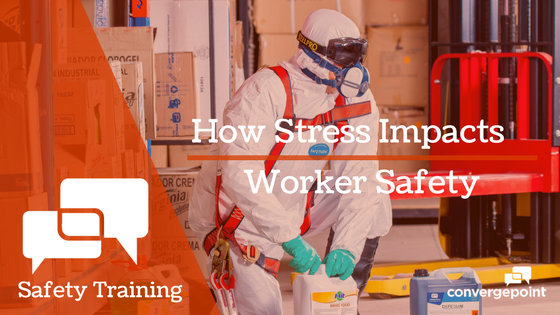 Any safety professional that believes or acts otherwise does not understand the full magnitude of stress in the workplace – and is doing their safety management system a huge disservice.